Audi has unveiled its second S-badge SUV named SQ7 at the ongoing 2016 Geneva Motor Show. SQ7 is the second SUV after the SQ5 model which has been put on display. The new SQ7 is based on the latest generation Audi Q7, which comes powered by a 4.0-litre twin-turbo direct injection diesel engine. The engine churns out a peak power of 435bhp and maximum torque of 900Nm. The all-new 2-tonne SQ7 sprints 0-100kmph in just 4.8 second. 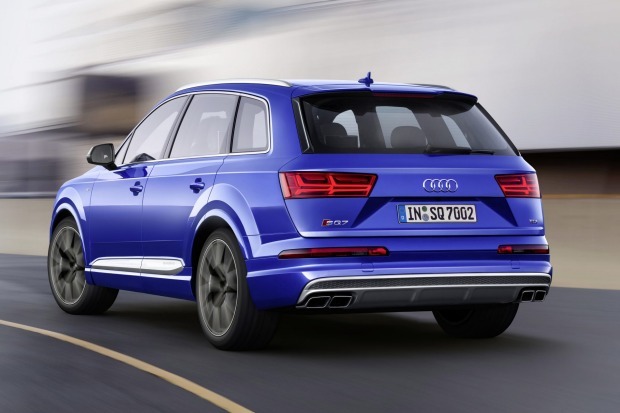 SQ7 gets an 8-speed Tiptronic automatic gearbox mated to the engine assembled with ‘Quattro’ all-wheel-drive system, transmitting power to all wheels. The car also offers a electronic body-roll stabilisation feature that facilitates better handling while cornering. Optionally, it also offers various value added packages like all-wheel steering, Dynamic package with sports differential and an electro-mechanical stabiliser unit. Apart from the luxury exterior, SQ7 offers generous cabin space and luxury features inside.It gets Audi’s virtual cockpit along with the Advanced MMI interface plus 23-speaker set. On the safety counterpart, the SUV comes loaded with front, side and curtain airbags along with traction control, hill assist, skid control, etc.